Efficiency as the best path to relieve a stressed power grid. With an aging infrastructure stressed by a variety of factors from inclement weather to a decreasing number of operational power plants to heightened electric consumption levels, today's grid often struggles to achieve its core function – keeping the lights on and the power flowing. Grid constraint refers to a scenario in which power demand exceeds transmission and distribution (T&D) capacity in a given area. Constraints have a negative impact on the grid's ability to deliver power reliably, as it is supposed to. 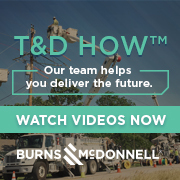 To alleviate these bottlenecks, utilities traditionally have taken steps to build out additional supply-side T&D networks. And, for better or worse, regulatory and market frameworks generally encourage such infrastructure development. However, just as "drill, baby, drill" fizzled as a mantra for the oil industry, "build, baby, build" is an approach that is beginning to be questioned as a way to address increased demand and aging infrastructure. • Building new infrastructure is expensive. Very expensive. The American Association of Civil Engineers calculates that an additional $107 billion of investment, beyond the currently anticipated investment of $566 billion, is needed by 2020 to keep the power grid functioning. • Building out new infrastructure isn't always logical. New construction is time consuming and can be difficult to execute in many of the very locations facing the greatest capacity issues – like a congested area of a major city. • Last, but certainly not least, building infrastructure that draws power from traditional energy sources is most damaging to the environment. Building energy efficiency offers a better path to address grid constraint and represents the cleanest, most cost-effective, quickest time-to-market resource available. Leveraging efficiency as a solution to grid constraints is referred to as geographic targeting, or "geo-targeting" for energy efficiency. This type of geo-targeting alleviates peak load, or overall power consumption during periods of greatest demand, ultimately flattening usage patterns and allowing existing supply capacity to meet customer demand. Identifying the constrained areas is generally easy for a utility. However, identifying which buildings can save the most in those areas, and what energy efficiency changes are required is much more difficult using traditional approaches. Fortunately, energy analytics are playing an increasing role in the geo-targeting process for utilities and program administrators. Analytics can rapidly identify buildings within constrained load areas that have the highest potential for energy savings to help utilities to narrow their focus. They can also determine the specific types of opportunities that exist in those buildings to engage customers and increase participation in efficiency programs. More importantly, utilities can now target buildings based on their savings potential during peak network periods. Analytics-enabled efficiency allows utilities to drive much deeper savings in less time and cost, supercharging the impact efficiency can have as a predictable resource for load management. Several utilities and program administrators – such as Con Edison and Efficiency Vermont – are already putting geo-targeting into practice today and have achieved significant results. But overall, the power industry must collectively ramp up geo-targeting efforts and leveraging efficiency as a resource. Re-align incentives such that utilities favor efficiency compared with T&D buildout: Today, most utilities are incented to drive savings throughout its portfolio – but only to a point. Energy efficiency target reductions are typically set at < 1%-2% of total consumption, year-over-year, with some rewards for exceeding those goals. To the extent that efficiency can be used to alleviate grid constraint, utilities should be further encouraged to do so via regulatory mechanisms whenever efficiency benefits outweigh the alternative. Understand and maximize the full potential of efficiency: While efficiency targets are set < 1%-2% per year, the potential is much greater. Commercial buildings, on average, can cost-effectively save 20% of their energy usage, with the best ones being able to save more than 35%. Data analytics-driven approaches can dramatically increase realized savings across a large portfolio. As such, policy makers, utilities and energy service providers should work towards achieving that potential rather than assume the status quo will continue. As several major US utilities move ahead with plans to decommission their nuclear power plants, the risk of grid constraints will only continue to grow. Geo-targeting, enabled and enhanced by energy analytics, represents a roadmap to the future of the US power infrastructure, helping to ensure that utilities can continue to serve customers without unnecessary expense or interruption for years to come. Bennett Fisher is the CEO and co-founder of Retroficiency, the building efficiency intelligence company for utilities and energy service providers. Retroficiency’s proprietary software platform creates a unique energy model of any building to provide actionable insights that enable the fastest, most cost-effective way to target buildings, engage customers, convert projects and track opportunities at scale. Contact Mr. Fisher at bfisher@retroficiency.com.